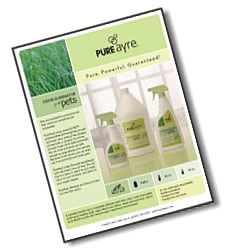 What makes PureAyre the safest way to eliminate pet odors? It's all natural, yet it's also all-powerful. PureAyre all natural because it's derived from plants. It's all-powerful because it contains enzymes that break apart the bonds of odor-causing compounds. The trick is, we've figured out how to bottle just the enzymes, without any of the bacteria or chemicals used by other odor eliminators on the market. Bacteria-based odor eliminators can be unstable and may stop working once used, so you have to keep reapplying them. This means you're stuck with a saturated spot–and the odor–for up to two weeks if you're dealing with a tough urine problem. It also means you're spending a lot more money because you have to saturate an area and then buy more! Yet 22 ounces of PureAyre does the work of two gallons of other products. Other odor eliminator products like Nature's Miracle contain alcohol. And the label says to spray the product directly onto your pet! Ouch! Can you say “dry, flakey skin”? 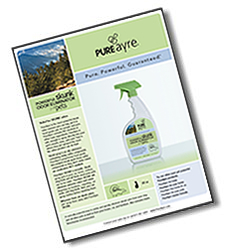 On the other hand, PureAyre works on contact with the compounds causing the odors. Because it's all natural, comprised only of plant-derived enzymes in purified water, you can spray it directly onto your pet's bedding and even on your pet–very useful when your dog finds a skunk to sneak up on. PureAyre is ideal for eliminating pet odors in the home, but it's also powerful enough to get rid of odors in veterinary clinics, kennels and boarding facilities, and even at cat and dog shows. It works, it works, with 50 cats, three dogs and seven birds--finally!